As we said in our last post, the weather forecast was calling for another cooling trend, so we continued heading south on Wednesday morning. We were making our way to the Escapees Rainbow Plantation in Summerdale, AL near Mobile. Our first day's drive was relatively long for us at almost 5 hours. We got a fairly early start and pulled into Montgomery South RV Park at about 1:30. It's a good thing we got there when we did because we had not made reservations, and we got the last site they had available. We have stayed at Montgomery South a couple of times before because it is a convenient place to stop on our way to or from Summerdale, and we didn't expect them to be full at this time of year. However, there is a construction project going on in Montgomery, and the campground has a bunch of construction workers staying there. The campground only has 23 sites, and it looks like the construction company bought about a dozen unmarked, surplus, FEMA trailers and set them up at the campground for some of their workers. The sites and roads at Montgomery South are gravel, and the spacing is not bad for a private campground. There is grass between the sites. Montgomery South is a Passport America campground with half-price camping. They apparently have only some of their sites designated as Passport America sites because, unfortunately, we didn't get the discount this time since they were full; but we did get the Good Sam discount. As we said, Montgomery South is a convenient place to stop for one or two nights. They are located near the interstate exit, but that means there is also a lot of traffic noise. There are also quite a few trains. Montgomery South has full hookups with 30/50-amp electric, cable and free Wi-Fi. We were located near the office, so the Wi-Fi signal was strong, although we got knocked off several times later in the evening. The connection was also pretty fast. You may have noticed we have added comments to this and another recent post about the strength and speed of the campground Wi-Fi connection. That's because now we sometimes use the campground Wi-Fi as long as the signal is strong and the connection is reasonably fast in order to save the usage of our Verizon Broadband. We had usage limits when we were on satellite internet, too; but the limits worked a little differently. On satellite, the data usage was also linked to time. The data limit gradually recovered during idle periods, so we could download a fair amount of data as long as we didn't do it over too short a period of time. With Verizon, the limit is strictly 5GB of data per month, period. Therefore, we will try to save on that limit when possible by using campground Wi-Fi. The good news is even if we do exceed our limit by quite a bit, the cost will still be lower or the same as satellite. We also found out about a nice feature that our Cradlepoint wireless router has we didn't know about. It's called Wi-Fi as WAN (wide area network). This feature lets the router receive an unsecured, campground Wi-Fi signal, encrypt it, and rebroadcast it as a secure connection to our computers. When using this feature, we connect to our own wireless router the same way we do when using our Verizon Broadband (except the Verizon modem is disabled) instead of connecting directly to the campground Wi-Fi. The next morning, we had about a three-hour drive to Summerdale, AL, which is one of our favorite locations. It is close to Mobile to the west and to Pensacola, FL to the east, so there are lots of things to do, lots of good seafood, and lots of convenient shopping. As we said, Rainbow Plantation is an Escapees campground. It has paved roads and grassy sites. There are live oak trees between most of the sites that provide welcome shade from the hot Alabama sun, but most of the trees aren't big enough yet to block our satellite dish, which we still use for TV. However, the shade means the grass on some of the sites is a little sparse. The good news is, the soil is sandy so it doesn't get muddy when it rains and water drains away quickly. This time, we got a site with grass that was fairly plentiful so we didn't need to put out our patio mat. As you can see from the next photo, we have a nice tree on our driver's side, which faces west, to shade us from the afternoon sun. The next photo shows a view down the road. Except for the dry-camp area (since Escapees campgrounds don't take reservations, they all have a dry-camp area for overflow), all the sites at Rainbow Plantation have full hookups. The sites on the eastern end have 30-amp electric, and the ones on the western end have 30/50 amps. There is Wi-Fi available; but since there is a fee, we will be using our Verizon Broadband. Although this is a 4G area, our connection is a little slower than we experienced in Nashville, but it's still faster than our satellite internet. Rainbow Plantation is one of our favorite campgrounds, and we usually stay here for at least several weeks on our way to and from Florida each fall and spring. The sites are widely spaced, and the campground is nice and quiet. The rates at Escapees campgrounds are very reasonable to begin with; and on top of that, Rainbow Plantation also has special rates from the end of March to the end of December where you pay for 15 days and get 5 additional days free. That brings down the nightly cost to under $12 a night plus electric (usually around $2 a day). Not bad for full hookups and generously-sized sites with grass and trees. In addition to the regular campground, Rainbow Plantation has deeded lots, seasonal sites and co-op sites. If Summerdale had winter temperatures a little warmer, we would definitely consider a seasonal site or putting our name on the waiting list for a co-op site. But since we even complain about occasional cold days we experience farther south in Florida, we're afraid Summerdale would not be warm enough for us in winter. Since we are planning to stay at Rainbow Plantation at least through Thanksgiving, Paul has a project or two in mind to get done during our stay. We'll report on those projects as they unfold in the weeks to come. In the meantime, we plan to have a couple of cheat days from our diet to have some fried shrimp at the Shrimp Basket in Foley and a panini or two at Panini Pete's in Fairhope. We also hope to squeeze a little sightseeing in between our projects and our relaxation, so stay tuned. As we said in our last post, the weather was cooling off in the Louisville area, so we continued heading south to Cedar Creek Corps of Engineers campground near Nashville in Mt. Juliet, TN. Cedar Creek has paved roads and gravel sites with 30/50-amp electric and water hookups. The sites are a good bit closer together than we usually see in Corps of Engineer campgrounds, and our loop probably had the closest spacing of all the loops. There are about a dozen lakefront sites and another dozen across the road from those that have much wider spacing, but the lakefront sites are hard to get on weekends, and they have too much shade for our rooftop satellite dish. The photo below shows our site at Cedar Creek. Since we were going to be at Cedar Creek over a weekend, we made advance reservations. It's a good thing we did because, although the campground was only about 1/3 filled when we first arrived on Wednesday, it started filling up on Thursday afternoon because local schools had Thursday and Friday off for fall break. Kids have only been in school less than two months, and they need a break already? Anyway, the photo below shows some of the other sites on our loop later Saturday afternoon after the campground filled up. Speaking of our rooftop satellite dish, we used Google Earth when we made our reservations to pick out a site with a clear view of the southern sky. After we arrived and leveled the motor home, we pushed the button to deploy the satellite dish. In the meantime, Paul went about connecting utilities outside and Margery put out the slides and worked on setting up the inside. After we finished up, we noticed the satellite dish had found the proper satellite, but we did not have a signal lock. Uh-oh. The same thing happened at our last stop, but we thought it was a problem on the satellite provider's end because it cleared up and we got a lock after a little while. Unfortunately, we did not have the same luck this time. After a call to MotoSat technical support, we determined that our transmitter had probably gone bad. A replacement part costs about $200, which isn't all that bad considering how much we use the internet. However, the big problem was we would have had to order the part, and since we were staying at a Corps of Engineers campground for a week, there would be no good way for us to receive the part. We have been reading about Verizon Broadband for some time, and we have toyed with the possibility of switching; but as long as our satellite internet dish was still working, we had no real reason to make a change. However, now that we were facing the inconvenience of being without internet for a week or more while we figured out how and where we were going to have the repair part shipped, we had an incentive to consider Verizon more seriously. The problem was, without an internet connection, we couldn't research our options online, and we didn't even have a good way to locate a Verizon Wireless Store. So we grabbed our laptop, hopped into the car and drove toward Nashville. We found a McDonalds that had Wi-Fi, so we did a little quick research and found a Verizon Wireless Store nearby. To make a long story short, after much deliberation, we decided to discontinue our satellite internet service, and we will now connect to the internet via Verizon Broadband using a Pantech USB modem. Since we have two computers, the modem will be plugged into a Cradlepoint wireless router so both computers can connect at the same time. We also considered Verizon MiFi, but the MiFi is battery powered, and we didn't want to worry about having to keep it charged. As it turns out, Nashville is a 4G area, and we are thrilled with the improved speed of our internet connection. We know 4G coverage is still limited, but it is growing all the time. We will probably have 3G much of the time for the foreseeable future; but 3G should still be at least as fast as satellite internet in most cases. When we first started full-timing, there were wide gaps in wireless internet, and it was not as fast as satellite internet. Since satellite internet is available EVERYWHERE as long as your dish can get a clear view of the southern sky, we went with satellite in spite of the fact we had to buy expensive equipment to do it. Now, with the advent of 4G, wireless broadband can be much faster than satellite. We know there are still areas of the country that don't have 3G, much less 4G coverage, and there are some areas that have no wireless internet coverage at all. We will have to deal with that when we run into it. Hopefully, we will be able to find campgrounds with Wi-Fi at least some of the time in those areas. Not having to depend on our rooftop satellite dish for our internet connection will broaden our campsite selections. We were always limited to sites with few or no trees. Our satellite TV shares the rooftop internet dish, so we will still have to be a little careful about too many trees. However, we will be able to use our portable TV satellite dish on a tripod in the event our site has too much shade for the rooftop dish. On one of our information gathering trips to the Verizon Store, we saw a sign for the Hermitage, which is President Andrew Jackson's home. Since it is located fairly close to where we were staying, we decided we were interested in seeing the Hermitage once we got our new internet connection up and running. Cedar Creek is nice and quiet during the week (except for the times when the maintenance crews are mowing); but it was crowded and zooy on the weekend. We usually don't do much sightseeing on the weekend, but we needed a break from the smoky campfires and the noise in the campground, so we decided to visit the Hermitage on Saturday. The photo below shows the front of the Hermitage. Andrew Jackson, who was the son of Scots-Irish immigrants, was born in 1767 near the border between North and South Carolina. Jackson was a military courier during the American Revolution when he was only 13. During this time, he was slashed with a sword by a British officer, and Jackson developed a deep hatred for the British. Andrew Jackson eventually got revenge when he later defeated the British at the Battle of New Orleans during the War of 1812. Jackson's father died before he was born, and Jackson became an orphan at age 14 when his mother died of cholera. Although Jackson's legal education was scant, he learned enough to become a frontier lawyer in the late 1800s. He moved west to an area that was located in what was to become Tennessee. When Tennessee became a state a few years later, he was elected Tennessee's first U. S. Representative. He also served as a Senator and as a Tennessee Supreme Court Judge. During this time, Jackson prospered as a planter and merchant. His toughness and aggressive personality earned him the nickname "Old Hickory." Andrew Jackson acquired a plantation he named the Hermitage near Nashville in 1804. He and his wife, Rachael, moved into a two-story, log farmhouse on the property. Between 1819 and 1921, the Jacksons built a two-story, eight-room, brick, Federal-style mansion on the property. The two-story log house was then disassembled and rebuilt into the two, single-story slave quarters shown in the next photo. Andrew Jackson was elected the 17th President of the United States in 1828, and he served two terms. His wife died a month after the 1828 election. During the campaign, his opponents called him a "jackass," a name he actually didn't mind. He was later one of the founders of the modern Democratic Party, and the donkey became its symbol after being popularized by political cartoonist Thomas Nast. In 1834, a fire severely damaged the original mansion, and Jackson had the house rebuilt in its current Greek Revival-style. The columns on the front are made of wood, but they are painted to look like the stone columns of a Greek temple. There is a guided tour of the home, but, as is usually the case, photography is not permitted inside. After Andrew Jackson died in 1845, his stepson continued to live at the Hermitage. Later, the Hermitage was sold to the state of Tennessee, so about 90% of the furnishings in the house are original. After the tour, we paused for a photo behind the house near Alfred's cabin. Alfred, who was born in 1812, was one of Jackson's slaves who lived his entire life at the Hermitage. Alfred stayed on as a caretaker after Jackson's death and even after the Civil War. He worked as a guide when the mansion was opened for tours in the late 1800s. We also toured the garden. Although most of the flowers had faded, there were a few like these dahlias still going strong. The orange color was almost blinding in the bright afternoon sun. Andrew and Rachael Jackson are buried in the garden. Alfred is also buried there off to the right side. You can just barely see his headstone above the top of the railing in the foreground. After we toured the mansion and grounds, we went through the museum. The museum has some of Andrew Jackson's personal items and numerous of old photos. We probably should have visited the museum first because the museum was laid out in chronological order, and it would have helped establish the historical timeline for the rest of our visit. There is a lot more to see in the Nashville area, especially if you're into country music. However, since we have shifted from sightseeing to relaxation mode, and since we spent the first two or three days in the area trying in vain to get our old satellite internet working and then running around researching and setting up our new Verizon Broadband, we decided to leave the rest of the sightseeing for another time. We watched a lot people leave the campground on Sunday. However, quite a few stayed, and quite a few new people came in later Sunday afternoon. Fortunately, the sites near us remained empty so we didn't have any more smoky campfires nearby. We relaxed for the remainder of our time at Cedar Creek and spent a good bit of time surfing the 'net. The weather forecast was predicting a general cool-down in the east, and the temperature around Nashville dropped like a stone on Tuesday afternoon. Our scheduled departure on Wednesday to head farther south was well timed. Stay tuned to find out about our next stop. It's been two weeks since we left Pittsburgh, and by God's grace, we have just about gotten everything accomplished to finalize our move to full-timing. As we traveled across South Dakota earlier this week, we were dumbstruck by the difference in terrain between the east and west side of the Missouri River. The east side is rolling, fertile farmland....good for raising crops including 12 different kinds of corn used to re-decorate the Corn Palace in Mitchell each year. 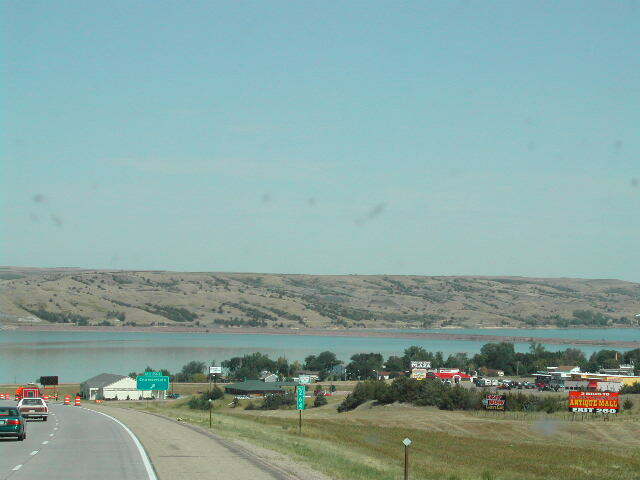 As we approached the Missouri River, we were taken aback by the stark change in terrain from low hills and farmland to rolling plains and deep canyons. We began to better understand why there is farming in the eastern part of the state and ranching in the western. After traveling another 3 hours, we approached the "Black Hills," a name that comes from the Lakota words Paha Sapa, which means "hills that are black." From a distance, that is the appearance of the Ponderosa pines that grow on the hills that rise several thousand feet above the surrounding prairie. The Lakotas are part ofthe Great Sioux Nation along with the Nakota and Dakota tribes. Our residence for the week is a campground located in the foothills of the Black Hills and several miles from Custer State Park and Mount Rushmore. A thunderstorm went through tonight, and we had a front-row seat on a beautiful lightning show. However, with the serious drought here, the Black Hills are at serious risk of forest fires. First, distances are very deceiving. We surmise that because the atmosphere is so clear it's very difficult to judge how far away anything is. Secondly, there are very few if any "housing plans." Most of what we have seen are apartments or trailer parks. Individual houses are isolated and far from stores. Finally, houses are utilitarian rather than stylistic. Very few are made from brick and their yards are not grass as we know it but rather prairie grasses. Check out the sidebar for additional options. There is a link that will show you our exact location and a photo album with additional pictures. Finally, if you would like to automatically receive each new post via e-mail, enter your e-mail address and click on subscribe.